Custom Background: upload the image by yourself. 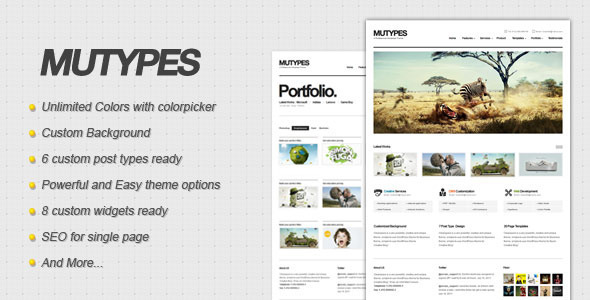 Powerful and Easy theme options. Homepage support: Custom content, Slidershow, Video, Special Image. 6 custom post types ready: portfolio, product, download, event, team, slidershow. 2 layouts and 2 sortable(classes and quick sand.) ready for portfolio. 2 layouts ready for blog. Portfolios support: slidershow, image, video. Blogs, events, products support: slidershow, image. 8 custom widgets ready: ads, tweets, flickr, blog, download, event, comment, search. SEO has been made a priority when designing the theme. A lot of shortcodes collection are ready for you.